Garlic is a staple ingredient in many cuisines around the world and in many cultures, people have used it as a medicine. Garlic belongs to the Allium family of vegetables, which also includes onions, scallions, shallots, leeks and chives. Whether raw, sautéed, roasted or dried, garlic is enjoyed for its pungent and unique flavor. Researchers are studying a variety of substances in garlic for their potential health benefits and anti-cancer activity. Garlic contain allyl compounds that are responsible for its odor and flavor. 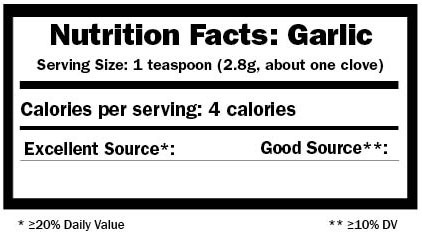 Because the serving size of garlic is just 1 teaspoon, the amount of nutrients and compounds per serving is small. Saponins: Compounds studied for anti-tumor activity. Garlic’s anti-cancer activity appears to stem from its allyl sulfur compounds and phytochemicals common to the allium family, which also include onions and scallions. Technically, garlic is a root vegetable but it is usually used for flavoring. Most of the research related to garlic and cancers have focused on colorectal and stomach. Yet emerging research suggests garlic may also play a role in the prevention of other cancers. The majority of laboratory research around garlic and cancers focuses on the effects of garlic’s allyl sulfur compounds, both the ones soluble in water and oil. One of the most well studied of these oil soluble compounds is allicin, which forms when the garlic tissue is damaged or crushed. The allicin quickly converts into several sulfur-containing compounds. Garlic’s allyl sulfur compounds – both the water and oil-soluble – also seem to prevent cancer by turning on tumor suppression genes. In animal studies, garlic compounds stimulate breakdown of testosterone and slow development of prostate cancer. The majority of the human studies related to garlic look at cancer risk by comparing populations who consume high amounts of garlic to those who eat little garlic. Studies comparing the diets of people who already have cancer with people who do not, suggest that consuming high amounts of garlic may also reduce risk of cancers of the esophagus, pancreas, breast, endometrium and prostate, but results of these studies are mixed. A small number of controlled clinical trials conducted in China studying the effect of garlic extract on stomach cancer and colorectal adenomas showed no link and a positive link, respectively. Another study investigated synthetic garlic and selenium and found a slight decreased risk among men for stomach cancer. Much more research is needed. Questions remain on how well humans absorb the allyl compounds formed from garlic, and the amount people need to experience the benefits that lab studies suggest may occur. Choose fresh garlic that is plump, dry and firm. Buy jars of pre-chopped garlic in oil to make cooking with garlic more convenient. Some of the allyl-sulfur compounds are oil-soluble, so you can use the oil too. Look for frozen, crushed or chopped garlic for other flavorful options. Fresh garlic will keep for several months at room temperature in a dark and dry space with some air circulation. Store jarred or frozen garlic as directed and look for expiration dates. To peel a garlic clove, place clove on a cutting board, cut off its bottom. Place the flat side of a large knife (sharp side away from you) on top of clove and hit it. It's easy to pop the clove right out of its papery skin. Allow crushed or chopped garlic to stand for about 10 minutes before cooking. This allows time for the enzyme alliinase to create allicin, the source of bioactive compound. Use peeled whole garlic cloves for a hint of garlic flavor, slices for subtle flavor, chopped for medium flavor or quick-cooking dishes, or use crushed garlic – by hand or with a garlic press – for strongest flavor. Add garlic to sautéed vegetables, pasta sauces, dips, soups, salad dressings and more. Prepare Black Bean Sauce (below) and keep warm, covered, on low heat. Adjust oven rack on second rung from top, at least 6 inches from broiler. Turn broiler on high. In medium bowl, mix together garlic, soy sauce, vinegar, oil and molasses. Stir to combine. Place filets in marinade, turning to coat well. Line rimmed baking sheet with foil. Arrange fillets skin side down and pour marinade on top. 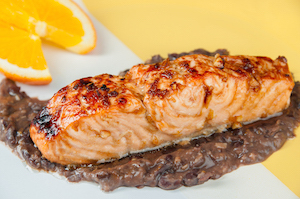 Broil salmon until internal temperature is 145 degrees F, about 5-6 minutes. On four dinner plates, divide Black Bean Sauce in center. With back of spoon swirl sauce in oval shape and clear a line in the oval to set the fillet. Carefully slide long spatula between salmon and skin. Gently lift up salmon away from skin and place lengthwise on sauce. Garnish plate with orange slices, if using, and serve. In small bowl, mash beans with liquid and set aside. In small saucepan, heat oil over medium heat. Add garlic and ginger and sauté until garlic starts to turn golden, about 1 minute. Add mashed beans and remaining ingredients. Mix thoroughly and cook, stirring often, until hot, about 2 minutes. Season to taste with salt and pepper. Reduce heat to low, stirring occasionally. Sauce should be slightly chunky and thick. Set aside, covered. If sauce thickens too much before plating, stir in water in 1 tablespoon increments and heat through. Q: Does garlic powder also have anti-cancer properties? A: The limited research done to date is unclear about exactly how much allyl sulfur compounds and antioxidant activity are retained in garlic powder. It likely depends upon the specific drying process used. Based on what research currently suggests, chopped garlic from the fresh bulb is the best choice. Q: Is it true that garlic is good for my heart? A: According to the National Institutes of Health garlic may be effective for decreasing blood pressure and preventing the hardening of arteries with age. However, garlic’s effect on cholesterol levels is less clear. Q: Are there health problems from eating too much garlic? A: Garlic seems to be safe for most adults. 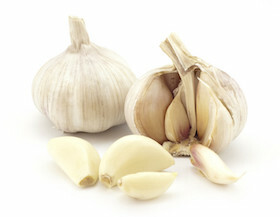 Some people may experience heartburn, upset stomach, bad breath and body odor particularly with raw garlic. One thing to note is that garlic can act as a blood thinner, meaning it can slow clotting and increase the risk of bleeding in some people. Large amounts of garlic compounds from supplements or eating very large portions of garlic could post risk if you are going in for surgery or have a bleeding disorder. When it comes to nutrients and cancer-protective compounds, it's possible to reach a point where more is not better. If you are considering garlic supplements, talk to your health care provider. Q: Which fruits and vegetables should I be eating? A: Eat as many different vegetables and fruits as you can. Variety is the key to obtaining the many protective phytochemicals. Each vegetable and fruit has its own profile of health-promoting substances. The phytochemicals found in cantaloupe are different from those in broccoli or leeks or cherries. Try to include a lot of colors on your plate. Aim to eat some bright red, green, orange, blue, purple and yellow vegetables and fruits each day. Q: Should I buy organic foods whenever possible? A: There are many reasons to eat organic foods, but currently, there is no convincing evidence that shows a difference related to cancer risk between organic and conventionally grown foods. Studies show pesticide residues on conventionally grown foods are almost always within safety tolerance limits. If you are concerned about pesticide residues and can afford to spend more, organic produce may be a choice for you. Eating generous servings of a large variety of veggies and fruits–whether organic or not–will benefit your health. The advantages of including more vegetables and fruits in your diet outweigh the potential risks from pesticides. Tsubura, A., et al., Anticancer effects of garlic and garlic-derived compounds for breast cancer control. Anti-cancer agents in medicinal chemistry, 2011. 11(3): p. 249-53. Powolny, A.A. and S.V. Singh, Multitargeted prevention and therapy of cancer by diallyl trisulfide and related Allium vegetable-derived organosulfur compounds. Cancer letters, 2008. 269(2): p. 305-14. Nian, H., et al., Modulation of histone deacetylase activity by dietary isothiocyanates and allyl sulfides: studies with sulforaphane and garlic organosulfur compounds. Environmental and molecular mutagenesis, 2009. 50(3): p. 213-21. Xiao, D., et al., Diallyl trisulfide suppresses growth of PC-3 human prostate cancer xenograft in vivo in association with Bax and Bak induction. Clinical cancer research : an official journal of the American Association for Cancer Research, 2006. 12(22): p. 6836-43. 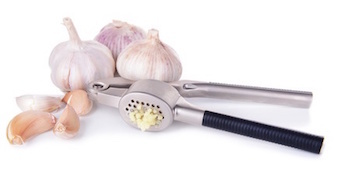 Rivlin, R.S., Can garlic reduce risk of cancer? The American journal of clinical nutrition, 2009. 89(1): p. 17-8. Gunadharini, D.N., et al., Antiproliferative effect of diallyl disulfide (DADS) on prostate cancer cell line LNCaP. Cell biochemistry and function, 2006. 24(5): p. 407-12. Chu, Q., et al., S-allylcysteine, a water-soluble garlic derivative, suppresses the growth of a human androgen-independent prostate cancer xenograft, CWR22R, under in vivo conditions. BJU international, 2007. 99(4): p. 925-32. Druesne-Pecollo, N. and P. Latino-Martel, Modulation of histone acetylation by garlic sulfur compounds. Anti-cancer agents in medicinal chemistry, 2011. 11(3): p. 254-9. Zhou, Y., et al., Consumption of Large Amounts of Allium Vegetables Reduces Risk for Gastric Cancer in a Meta-analysis. Gastroenterology, 2011. 141(1): p. 80-9. Hsing, A.W., et al., Allium vegetables and risk of prostate cancer: a population-based study. Journal of the National Cancer Institute, 2002. 94(21): p. 1648-51. Gao, C.M., et al., Protective effect of allium vegetables against both esophageal and stomach cancer: a simultaneous case-referent study of a high-epidemic area in Jiangsu Province, China. Japanese journal of cancer research : Gann, 1999. 90(6): p. 614-21. Galeone, C., et al., Allium vegetables intake and endometrial cancer risk. Public health nutrition, 2009. 12(9): p. 1576-9. Chan, J.M., F. Wang, and E.A. Holly, Vegetable and fruit intake and pancreatic cancer in a population-based case-control study in the San Francisco bay area. Cancer epidemiology, biomarkers & prevention : a publication of the American Association for Cancer Research, cosponsored by the American Society of Preventive Oncology, 2005. 14(9): p. 2093-7. Galeone et al. Onion and garlic use and human cancer. Am J Clin Nutr November 2006.vol. 84 no. 1027-1032. Dorant, E., P.A. van den Brandt, and R.A. Goldbohm, Allium vegetable consumption, garlic supplement intake, and female breast carcinoma incidence. Breast cancer research and treatment, 1995. 33(2): p. 163-70. You, W.C., et al., Randomized double-blind factorial trial of three treatments to reduce the prevalence of precancerous gastric lesions. Journal of the National Cancer Institute, 2006. 98(14): p. 974-83. Tanaka, S., et al., Effects of aged garlic extract (AGE) on colorectal adenomas: a double-blinded study. Hiroshima journal of medical sciences, 2004. 53(3-4): p. 39-45. Li, H., et al., An intervention study to prevent gastric cancer by micro-selenium and large dose of allitridum. Chinese medical journal, 2004. 117(8): p. 1155-60. Alpers, D.H., Garlic and its potential for prevention of colorectal cancer and other conditions. Current opinion in gastroenterology, 2009. 25(2): p. 116-21. Henning, S.M., et al., Antioxidant capacity and phytochemical content of herbs and spices in dry, fresh and blended herb paste form. International journal of food sciences and nutrition, 2011. 62(3): p. 219-25. Berges, R., et al., Comparison of the chemopreventive efficacies of garlic powders with different alliin contents against aflatoxin B1 carcinogenicity in rats. Carcinogenesis, 2004. 25(10): p. 1953-9. Amagase, H., Clarifying the real bioactive constituents of garlic. The Journal of nutrition, 2006. 136(3 Suppl): p. 716S-725S. Nicastro, H., S. Ross, and J. Milner. garlic and onions: Their cancer prevention properties. Cancer Prevention Research, 2015. 8(3): p. 181-189. Brasky TM et al. Specialty supplements and prostate cancer risk in the VITamins and Lifestyle (VITAL) cohort. Nutr Cancer. 2011;63(4):573-82.